Sandshrew in game: 5,400 Who? Important notice! Pokemon Sandshrew is a fictional character of humans. Sandshrew is a bipedal mammalian Pokémon, but runs on all fours in the anime. Its yellow hide is dry, tough, blends in with desert sand, and has a brick pattern, but its underbelly and muzzle are white. Sandshrew has blue, almond-shaped eyes, a pointed snout, and triangular ears with white insides. Its tail is thick and conical. It has two long claws on each foot and three sharp claws on its forepaws, which are used to burrow. Sandshrew spends much of its time hidden underground in deep burrows. It only emerges to hunt, which it does by waiting within its burrow to instantly lunge out and drag in passing prey. Sandshrew can quickly curl into a tight ball to protect itself from great falls and opponents, but may also throw sand at attackers. While its body can efficiently absorb water to facilitate life in the desert, Sandshrew has been found in caves as well. In the Alola region, Sandshrew migrated to snowy mountains due to the volcanic activity near the desert areas. Its body is a light, icy blue and with a cream-colored belly and muzzle. Its head now resembles an igloo. Thicker plates form a dome around its head and its ears resemble an igloo's entrances. In adapting to this cold climate, its body became larger and heavier with a shell of ice covering its hide. The steel-like covering grants it extra defense, but it is unable to curl into a ball like its desert counterpart. Alolan Sandshrew's claws allow it to move without slipping on icy surfaces, but it slides on its stomach when it needs to move quickly. Sandshrew was first featured in The Path to the Pokémon League. It was owned by a Pokémon Trainer named A.J.. Despite A.J. 's seemingly barbaric training methods (e.g. using a whip, training in a pool), it was very loyal to him. A Sandshrew was one of the Pokémon that played Hide-n-Seek in Pikachu's PikaBoo. Sandshrew camouflaged itself in front of a brick wall. Mira enlisted Ash and his friends to help her retrieve her Sandshrew that was lost at the bottom of an artificial lake composed by a dammed river in Sandshrew's Locker!. Ash and Pikachu pass three Sandshrew in Pokémon - I Choose You! while being chased by a flock of wild Spearow. 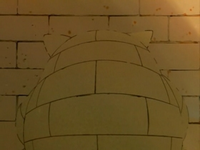 An ailing Sandshrew is seen briefly near the beginning of Clefairy and the Moon Stone. It was seen lying down, which Seymour described as it "drying out" because of the significant increase of light sources inside Mt. Moon. A Sandshrew appeared in Pokémon Fashion Flash. A Sandshrew was seen in a Pokémon Center in Sparks Fly for Magnemite. A Sandshrew appeared in Mewtwo Strikes Back. 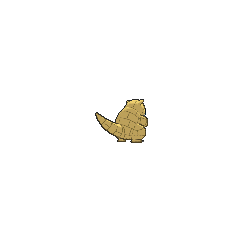 A Sandshrew was among the Pokémon seen at Professor Oak's Laboratory in Showdown at the Po-ké Corral. A Trainer's Sandshrew was brought to the Pokémon Center in The Lost Lapras. A Trainer's Sandshrew was treated by Nurse Joy in The Joy of Pokémon. 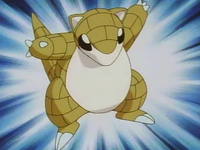 Sandshrew also appeared in The Power of One. Sandshrew made an appearance in Tanks a Lot!. A Sandshrew was one of the Pokémon stolen by Butch and Cassidy in The Fortune Hunters. A Sandshrew appeared in Beauty and the Breeder where it participated in a Pokémon Beauty Contest. Multiple Sandshrew also appeared in Celebi: Voice of the Forest. A Sandshrew was one of the inhabitants of a Pokémon oasis in Got Miltank?. Two Sandshrew were among the Pokémon seen at Wings Alexander's barn in Throwing in the Noctowl. A Sandshrew was seen in the wild in The Legend of Thunder!. A Sandshrew appeared in A Tyrogue Full of Trouble receiving an apple from a Tyrogue. Two Sandshrew were among the Pokémon seen at Professor Oak's Laboratory in Showdown at the Oak Corral. A Sandshrew was used by one of the students of the Pokémon Trainer's School in Gonna Rule The School!. 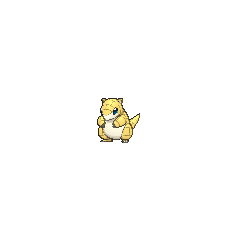 A Sandshrew appeared under the ownership of a Coordinator in Hi Ho Silver Wind!. Sandshrew appeared in the opening of Lucario and the Mystery of Mew and living in the Tree of Beginning. Sandshrew also appeared in Pokémon Ranger and the Kidnapped Riolu! Part One. A Sandshrew made a brief cameo along with a Sandslash in Destiny Deoxys and Giratina and the Sky Warrior. A Sandshrew was also seen at the Shelter Town's Pokémon Center in Battling a Cute Drama!. 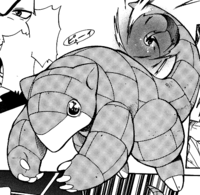 A Sandshrew appeared in Diancie and the Cocoon of Destruction. 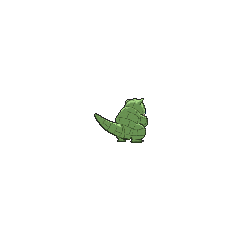 A Sandshrew appeared as a silhouette in SM003. Another Sandshrew appeared in File 3: Giovanni at Silph Co.
Sandshrew makes a cameo in Onix is On!, part of the Red, Green & Blue chapter, battling against Red's Bulbasaur as a Pewter GymTrainer's Pokémon. Red caught a Sandshrew prior to Make Way for Magmar! he uses to fight Fire-types such as Magmar. In Murkrow Row, Gold has a Sandshrew residing in his house, but has never used it in battle. A Sandshrew was one of the Pokémon sent to help the fight in Ilex Forest in The Last Battle XIII. 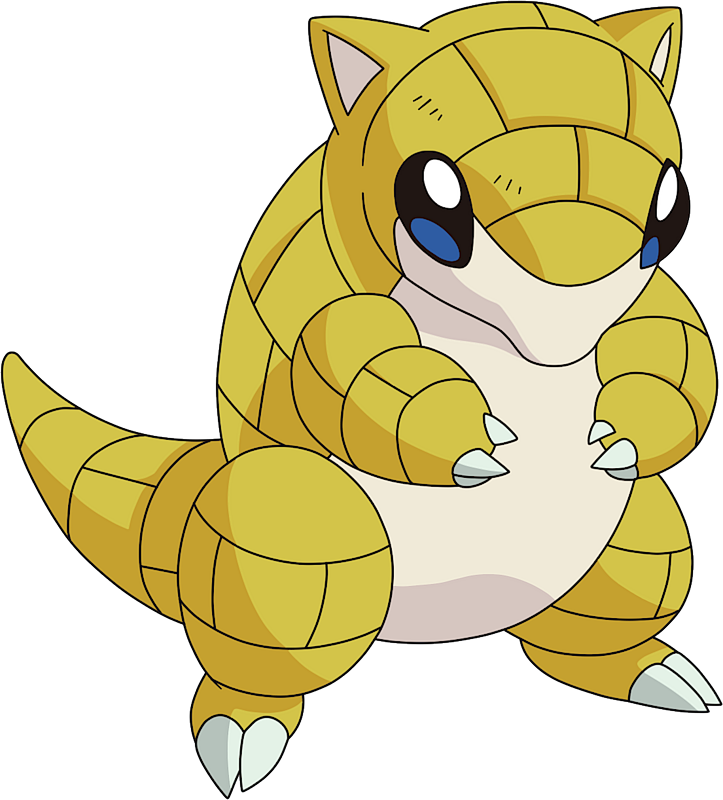 Sandshrew is based on the armadillo, a mammal that curls up into a ball, has sharp claws, and lives in desert regions. Both Sandshrew and Sandslash are mentioned to have poisonous claws, similar to how some species of the shrew are poisonous. 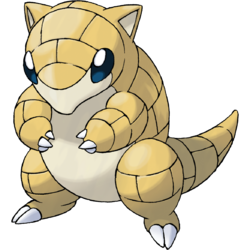 Sandshrew also closely resembles an pangolin. Alolan Sandshrew seems to also be based on an igloo.